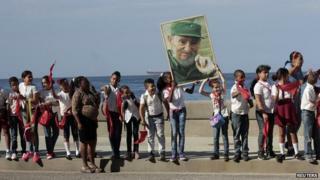 A senior American official has said the United States is "very open" to building a new relationship with Cuba. However, Edward Alex Lee of the US state department stressed that any improvement should go hand-in-hand with more political freedom on the communist-run island. He said the two countries had held "very constructive" talks on migration and other issues this week. But he declined to give any details of what he called "substantial progress". Mr Lee, who has been on an official visit to Cuba, added the two nations would seek to continue these rare negotiations. "Despite our historically difficult relationship...we have been able to speak to each other in a respectful and thoughtful manner," he told a news conference in Havana. But he added that the US wanted a "fundamental change" in the Cuban government's attitude towards its own people. "We want to have that opening reflect - from the Cuban side - a respect for Cubans to express themselves freely, to be able to petition their government with grievances without the danger of arrest." Talks between the two historic enemies were suspended in 2011 but resumed last July. The main focus of the latest talks was migration: discouraging Cubans from risking their lives at sea to reach the US, by ensuring that there were safe and legal alternatives. The BBC correspondent in Havana, Sarah Rainsford, says the fact that the official meetings are continuing appears to reflect a new pragmatism in the relations between the two neighbours. The US and Cuba cut formal diplomatic ties more than five decades ago. The talks, which took place in the Cuban capital, were also centred on other topics of mutual interest, including aviation safety, co-operation in counter-narcotics work, protocols on preparing for oil spills, search-and-rescue work, and renewing postal services between the two neighbours. They came after the first handshake between US President Barack Obama and his counterpart, Raul Castro, last month, at the memorial service for Nelson Mandela in South Africa. Mr Lee insisted however that the handshake was not pre-arranged, but reflected what he called the "innate graciousness" of Mr Obama. The dialogue between the Cold War foes was cut after Cuba sentenced a US citizen, Alan Gross, to 15 years in prison for smuggling illegal satellite equipment into the country. Mr Lee confirmed that he had visited Mr Gross in prison, adding that the US was "deeply concerned" about his wellbeing. He expressed hope that the Cuban government would free him, arguing the contractor had simply been providing internet access for Cuba's small Jewish community.